This article describes the hardware design and Verilog implementation of a RISC CPU IP core compatible with the Microchip PIC10F200-series of microcontrollers. The CPU IP Core was designed for a client where a small but very fast CPU needed to be implemented in an FPGA. Since the code is running from on-chip RAM cells, the speed of the CPU IP Core is around 50 times faster than the original Microchip PIC10F200-series implementation. Note that this article is a short summary of the design and implementation of the RISC CPU IP Core. The detailed design documentation can be downloaded here in PDF format. Full Verilog source code including a complete set of test benches is available here. The PIC10 IP Core is an instruction-compatible Verilog implementation of the Microchip PIC10F200-series microcontrollers. We chose to implement the PIC10F200-series CPU because of the small but effective RISC CPU architecture and the availability of free software development tools from Microchip. The PIC10F200-series of microcontrollers only has 33 instructions which makes the final hardware implementation compact. The CPU can address up to 512 instruction words which is small enough to fit on-chip but still large enough to be practically useful when programmed in assembly language. Figure 1 below shows the main modules of the PIC10 RISC CPU IP Core. Figure 1. The main modules and interconnects in the PIC10 RISC CPU IP Core. 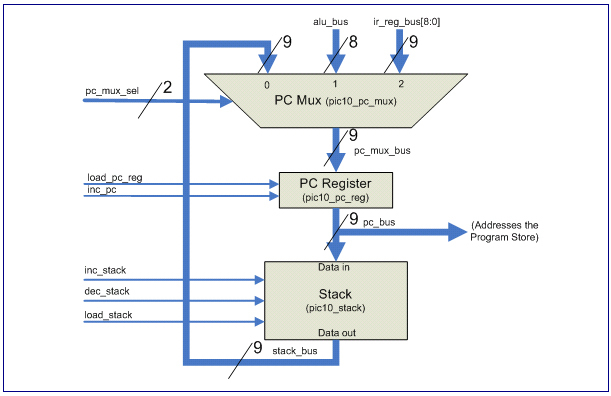 As figure 1 shows, the pic10 module contains the pic10_datapath and pic10_controller modules while the pic10_program_store is external to the CPU Core. This means that the Program Store can be located off-chip if needed. Locating the Program Store on-chip however enables the CPU Core to execute at the internal clock speed of the FPGA which results in very fast clock frequency compared to the original PIC10F200. Figure 2 below shows a somewhat simplified datapath architecture where the eight Special Function Registers 0..7 are not shown. This datapath is sufficient to execute most instructions so it will be used to introduce the overall PIC10 CPU IP Core architecture. Figure 2. A simplified datapath that illustrates the basic datapath architecture. Most instructions in the PIC10F200 architecture operate on either the 'W' or one of the 'f' registers. The 'W' register is input as the ALUs first operand while the currently addressed 'f' register is input as the second ALU operand. The ALU result is output on 'alu_bus' from where it is loaded into either the 'W' register or into the currently addressed 'f' register. The Controller either asserts the 'load_w_reg' or the 'load_ram_reg' depending on if the instruction word in the instruction Register directs the result to the 'W' or 'f' register respectively. In order for the ALU to be able to update the STATUS register bits Z, C, and DC a separate 'status_bus' exists together with three control signals named 'load_z', 'load_d' and 'load_dc'. These signals are displayed below in figure 3. Also note that figure 3 contains the 'ALU Mux' on operand input two which allows the Controller to select the second ALU operand to come from either the RAM Registers (shown above in figure 2) or from one of the eight SFR Registers 0..7. Figure 3. The actual datapath surrounding the ALU. The ALU knows from the 'ir_reg_bus' which instruction word is currently being executed. The 'carry_bit' input is connected to the C bit in the STATUS register. This is used during additions and subtractions. 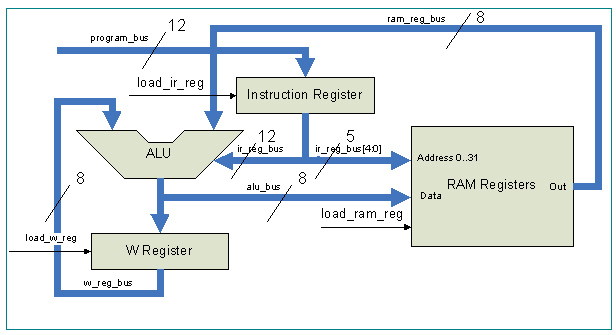 The 'ram_data_bus' input to the ALU Mux comes from the RAM registers as shown above in figure 1. The 'sfr_data_bus' comes from the currently addressed SFR register. The PIC10 architecture allows both direct and indirect addresses. A direct address is encoded directly in the 12-bit instruction word while an indirect address is taken from the FSR Special Function Register. The address generation logic is shown below in figure 4. Figure 4. The Register Address Mux selects either a direct or indirect address. 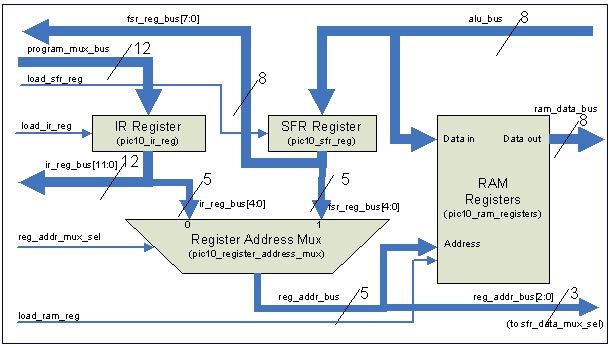 As can be seen in Figure 4, the Register Address Multiplexer passes through either the 'fffff' field in the instruction word (bits 4:0) or the value in the SFR register. The 'reg_addr_mux_sel' signal determines which source bus to route to 'reg_addr_bus'. The PIC10 CPU architecture has a two-level stack that enables subroutines to be called via the CALL/RETLW instruction pair. Jumps to an absolute address can also be done via the GOTO instruction. Figure 5 below shows the Program Counter Datapath required to allow the CALL, RETLW and GOTO instructions to be implemented. Figure 5. The Program Counter Datapath allows the PC to pushed, popped and loaded from 'alu_bus'. As Figure 5 shows, the 'pc_mux_sel' input selects the source of the data on the 'pc_mux_bus'. The 'pic10_pc_reg' register is loaded on the rising edge of the clock signal when the 'load_pc_reg' signal is asserted. The 'inc_pc' signal is used to increment the Program Counter as each instruction is executed. The 'inc_stack' and 'dec_stack' signals are used to select which stack register will be loaded when the 'load_stack' signal is asserted. The 'stack_bus' always outputs the data in the current stack location (i.e. the data previously written to the stack location). The PIC10 CPU IP Core contains three bidirectional 8-bit I/O ports while the Microchip PIC10F20x architecture only has a single GPIO register (where only 4 bits are implemented due to lack of pins on the package). The I/O port bits can individually be programmed as input or output via the TRIS instruction. The output data (for output ports) is programmed into GPIO registers 5, 6 and 7 (where GPIO registers 5 and 7 replaces the not implemented OSCCAL and CMCON0 registers). Figure 6 below shows the internal architecture of the 'pic10_tri_state_port' module. Figure 6. The 'pic10_tri_state_port' module contains the 8-bit bi-directional I/O port logic. 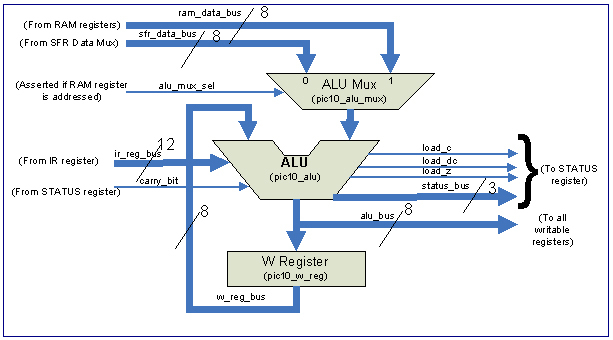 As can be seen in figure 6, the 'alu_bus' input allows the TRIS and GPIO 8-bit registers to be loaded from 'alu_bus. A TRIS registers (5, 6 or 7) is loaded from 'alu_bus' when a TRIS instruction is executed. A GPIO register (5, 6 or 7) is loaded when Special Function Registers 5, 6 or 7 is the write target of an instruction (i.e. MOVWF). As shown in Figure 1, the 'pic10_controller' module is connected via a number of inputs and outputs to the 'pic10_datapath' module. The controller is responsible for decoding the current instruction in the IR register and set up the datapath control signals so that the data is correctly routed from the source to the destination register accordingly to the semantics of the instruction. As the instruction in the IR changes so does the functionality of the Controller. The Controller is essentially a simple state machine that asserts a pre-determined number of signals for the various instructions. 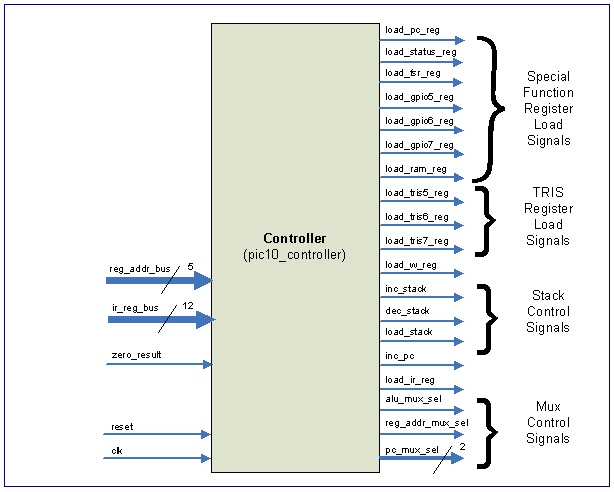 Figure 7 below shows the inputs and outputs of the 'pic10_controller' module. Figure 7. The input and output signals on the Controller module. For detailed information of the control signals that get asserted for each of the 33 instructions in the PIC10 instruction set please see the full documentation (PDF format). The full documentation contains sections that describe the datapath control signals that need to be asserted for each instruction. The path the data is routed from the source to the destination register are illustrated via block diagrams as well as via pseudo Verilog code. Please refer to the Microchip PIC10F200/202/204/206 data sheet for the detailed syntax and description of the various instructions. The Verilog source code for the PIC10 RISC CPU IP Core can be downloaded here. The zip file also contains test benches for all of the modules. 1) The Microchip PIC10F200/202/204/206 Data Sheet is available on Microchip's web site. 3) For advanced HDL design and implementation, "Advanced Digital Design with the Verilog HDL" by Michael D. Cilette is recommended. ISBN 0-13-089161-4. John Gulbrandsen is the founder and president of Summit Soft Consulting. John has a formal background in Microprocessor-, digital- and analog- electronics design as well as in embedded and Windows systems development. John has programmed Windows since 1992 (Windows 3.0). He is as comfortable with programming Windows applications and web systems in C++, C# and VB as he is writing and debugging Windows kernel mode device drivers in SoftIce. Summit Soft Consulting is a Southern California-based consulting firm specializing in Microsoft's operating systems and core technologies. Our specialty is Windows Systems Development including kernel mode and NT internals programming.